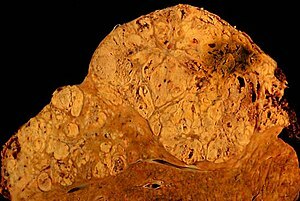 ^ Forner A, Llovet JM, Bruix J. Hepatocellular carcinoma. The Lancet. 2012, 379 (9822): 1245–1255. doi:10.1016/S0140-6736(11)61347-0. ^ Kumar V, Fausto N, Abbas A (编). Robbins & Cotran Pathologic Basis of Disease 9th. Saunders. 2015: 870–873. ISBN 978-1455726134. ^ Liver cancer overview. Mayo Clinic. ^ Heidelbaugh, Joel J.; Bruderly, Michael. Cirrhosis and chronic liver failure: part I. Diagnosis and evaluation. American Family Physician. 2006-09-01, 74 (5): 756–762. ISSN 0002-838X. PMID 16970019. ^ Alter MJ. Epidemiology of hepatitis C virus infection. World Journal of Gastroenterology. 2007, 13 (17): 2436–41. PMID 17552026. doi:10.3748/wjg.v13.i17.2436. ^ White DL, Kanwal F, El-Serag HB. Association between nonalcoholic fatty liver disease and risk for hepatocellular cancer, based on systematic review. Clinical Gastroenterology and Hepatology. 2012, 10 (12): 1342–59. PMC 3501546. PMID 23041539. doi:10.1016/j.cgh.2012.10.001. ^ Huang YC, Tsan YT, Chan WC, Wang JD, Chu WM, Fu YC, Tong KM, Lin CH, Chang ST, Hwang WL. Incidence and survival of cancers among 1,054 hemophilia patients: A nationwide and 14-year cohort study. American Journal of Hematology. 2015, 90 (4): E55–E59. doi:10.1002/ajh.23947. ^ Shetty, Shrimati; Sharma, Nitika; Ghosh, Kanjaksha. Epidemiology of hepatocellular carcinoma (HCC) in hemophilia. Critical Reviews in Oncology / Hematology. 2016-03-01, 99: 129–133. ISSN 1040-8428. doi:10.1016/j.critrevonc.2015.12.009 （英语）. ^ Tanaka M, Katayama F, Kato H, Tanaka H, Wang J, Qiao YL, Inoue M. Hepatitis B and C virus infection and hepatocellular carcinoma in China: A review of epidemiology and control measures. Journal of Epidemiology. 2011, 21 (6): 401–416. PMC 3899457. PMID 22041528. doi:10.2188/jea.JE20100190. ^ Hassan MM, Curley SA, Li D, Kaseb A, Davila M, Abdalla EK, Javle M, Moghazy DM, Lozano RD, Abbruzzese JL, Vauthey JN. Association of diabetes duration and diabetes treatment with the risk of hepatocellular carcinoma. Cancer. 2010, 116 (8): 1938–1946. PMID 20166205. doi:10.1002/cncr.24982. Diabetes appears to increase the risk of HCC, and such risk is correlated with a long duration of diabetes. Relying on dietary control and treatment with sulfonylureas or insulin were found to confer the highest magnitude of HCC risk, whereas treatment with biguanides or thiazolidinediones was associated with a 70% HCC risk reduction among diabetics. ^ Donadon, Valter. Antidiabetic therapy and increased risk of hepatocellular carcinoma in chronic liver disease. World Journal of Gastroenterology. 2009, 15 (20): 2506–11. PMC 2686909. PMID 19469001. doi:10.3748/wjg.15.2506. Our study confirms that type 2 diabetes mellitus is an independent risk factor for HCC and pre-exists in the majority of HCC patients. Moreover, in male patients with type 2 diabetes mellitus, our data shows a direct association of HCC with insulin and sulphanylureas treatment and an inverse relationship with metformin therapy. ^ Siegel A, Zhu AX. Metabolic Syndrome and hepatocellular carcinoma. Cancer. 2009, 115 (24): 5651–5661. PMC 3397779. PMID 19834957. doi:10.1002/cncr.24687. The majority of 'cryptogenic' HCC in the United States is attributed to nonalcoholic fatty liver disease (NAFLD), a hepatic manifestation of the metabolic syndrome... It is predicted that metabolic syndrome will lead to large increases in the incidence of HCC over the next decades. A better understanding of the relation between these 2 diseases ultimately should lead to improved screening and treatment options for patients with HCC. ^ Hepatocellular Carcinoma and Diseases. [2010-05-12]. ^ Höpfner M, Huether A, Sutter AP, Baradari V, Schuppan D, Scherübl H. Blockade of IGF-1 receptor tyrosine kinase has antineoplastic effects in hepatocellular carcinoma cells. Biochemical Pharmacology. 2006, 71 (10): 1435–1448. PMID 16530734. doi:10.1016/j.bcp.2006.02.006. Inhibition of IGF-1R tyrosine kinase (IGF-1R-TK) by NVP-AEW541 induces growth inhibition, apoptosis and cell cycle arrest in human HCC cell lines without accompanying cytotoxicity. Thus, IGF-1R-TK inhibition may be a promising novel treatment approach in HCC. ^ Huynh H, Chow PK, Ooi LL, Soo KC. A possible role for insulin-like growth factor-binding protein-3 autocrine/paracrine loops in controlling hepatocellular carcinoma cell proliferation. Cell Growth and Differentiation. 2002, 13 (3): 115–122. PMID 11959812. Our data indicate that loss of autocrine/paracrine IGFBP-3 loops may lead to HCC tumor growth and suggest that modulating production of the IGFs, IGFBP-3, and IGF-IR may represent a novel approach in the treatment of HCC. ^ Martin NM, Abu Dayyeh BK, Chung RT. Anabolic steroid abuse causing recurrent hepatic adenomas and hemorrhage. World Journal of Gastroenterology. 2008, 14 (28): 4573–4575. PMC 2731289. PMID 18680242. doi:10.3748/wjg.14.4573. This is the first reported case of hepatic adenoma re-growth with recidivistic steroid abuse, complicated by life-threatening hemorrhage. ^ Gorayski P, Thompson CH, Subhash HS, Thomas AC. Hepatocellular carcinoma associated with recreational anabolic steroid use. British Journal of Sports Medicine. 2007, 42 (1): 74–75. PMID 18178686. doi:10.1136/bjsm.2007.03932. Malignant transformation to HCC from a pre-existing hepatic adenoma confirmed by immunohistochemical study has previously not been reported in athletes taking anabolic steroids. Further studies using screening programmes to identify high-risk individuals are recommended. ^ Chien-Jen Chen; Hwai-I. Yang; Jun Su; Chin-Lan Jen; San-Lin You; Sheng-Nan Lu; Guan-Tarn Huang; Uchenna H. Iloeje. Risk of Hepatocellular Carcinoma Across a Biological Gradient of Serum Hepatitis B Virus DNA Level. JAMA. 2006, 295 (1): 65–73. PMID 16391218. doi:10.1001/jama.295.1.65. ^ Clinical features and diagnosis of primary hepatocellular carcinoma. UptoDate. [2014-02-04]. ^ Ertle, JM; Heider, D; Wichert, M; Keller, B; Kueper, R; Hilgard, P; Gerken, G; Schlaak, JF. A combination of α-fetoprotein and des-γ-carboxy prothrombin is superior in detection of hepatocellular carcinoma. Digestion. 2013, 87 (2): 121–31. PMID 23406785. doi:10.1159/000346080. ^ El-Serag HB, Marrero JA, Rudolph L, Reddy KR. Diagnosis and treatment of hepatocellular carcinoma. Gastroenterology. May 2008, 134 (6): 1752–63. PMID 18471552. doi:10.1053/j.gastro.2008.02.090. ^ Duseja, Ajay. Staging of Hepatocellular Carcinoma. Journal of Clinical and Experimental Hepatology. 2014-08-01, 4: S74–S79. PMC 4284240. PMID 25755615. doi:10.1016/j.jceh.2014.03.045. ^ Llovet JM, Brú C, Bruix J. Prognosis of hepatocellular carcinoma: the BCLC staging classification. Seminars in Liver Disease. 1999, 19: 329–38. PMID 10518312. doi:10.1055/s-2007-1007122. ^ Katyal, Sanjeev; Oliver, James H.; Peterson, Mark S.; Ferris, James V.; Carr, Brian S.; Baron, Richard L. Extrahepatic Metastases of Hepatocellular Carcinoma. Radiology. 2000, 216 (3): 698–703. doi:10.1148/radiology.216.3.r00se24698. ^ Hepatitis B: Prevention and treatment. [2013-08-28]. （原始内容存档于2013-07-24）. "WHO aims at controlling HBV worldwide to decrease the incidence of HBV-related chronic liver disease, cirrhosis, and hepatocellular carcinoma. by integrating HB vaccination into routine infant (and possibly adolescent) immunization programs." ^ Kansagara, Devan; Papak, Joel; Pasha, Amirala S.; O'Neil, Maya; Freeman, Michele; Relevo, Rose; Quiñones, Ana; Motu'apuaka, Makalapua; 等. Screening for Hepatocellular Carcinoma in Chronic Liver Disease. Annals of Internal Medicine. 2014-06-17, 161: 261. doi:10.7326/M14-0558. ^ Pompili, Maurizio. Bridging and downstaging treatments for hepatocellular carcinoma in patients on the waiting list for liver transplantation. World Journal of Gastroenterology: 7515. PMC 3837250. PMID 24282343. doi:10.3748/wjg.v19.i43.7515. ^ Gbolahan, Olumide B.; Schacht, Michael A.; Beckley, Eric W.; LaRoche, Thomas P.; O'Neil, Bert H.; Pyko, Maximilian. Locoregional and systemic therapy for hepatocellular carcinoma. Journal of Gastrointestinal Oncology. April 2017, 8 (2): 215–228. ISSN 2078-6891. PMC 5401862. PMID 28480062. doi:10.21037/jgo.2017.03.13. ^ Ma, Ka Wing; Cheung, Tan To. Surgical resection of localized hepatocellular carcinoma: patient selection and special consideration. Journal of Hepatocellular Carcinoma. December 2016,. Volume 4: 3. doi:10.2147/JHC.S96085. ^ The Singapore Liver Cancer Recurrence (SLICER) Score for Relapse Prediction in Patients with Surgically Resected Hepatocellular Carcinoma. PLOS ONE: e0118658. doi:10.1371/journal.pone.0118658. ^ Fan, Jia; Yang, Guang-Shun; Fu, Zhi-Ren; Peng, Zhi-Hai; Xia, Qiang; Peng, Chen-Hong; Qian, Jian-Ming; Zhou, Jian; Xu, Yang; 等. Liver transplantation outcomes in 1,078 hepatocellular carcinoma patients: a multi-center experience in Shanghai, China. Journal of Cancer Research and Clinical Oncology. 2009, 135 (10): 1403–1412. PMID 19381688. doi:10.1007/s00432-009-0584-6. ^ Vitale, Alessandro; Gringeri, Enrico; Valmasoni, Michele; D'Amico, Francesco; Carraro, Amedeo; Pauletto, Alberto; D'Amico, Francesco Jr.; Polacco, Marina; D'Amico, Davide Francesco; Cillo, Umberto. Longterm results of liver transplantation for hepatocellular carcinoma: an update of the University of Padova experience. Transplantation Proceedings. 2007, 39 (6): 1892–1894. PMID 17692645. doi:10.1016/j.transproceed.2007.05.031. ^ Obed, Aiman; Tsui, Tung-Yu; Schnitzbauer, Andreas A.; Obed, Manal; Schlitt, Hans J.; Becker, Heinz; Lorf, Thomas. Liver Transplantation for Hepatocellular Carcinoma: Need for a New Patient Selection Strategy: Reply. Langenbeck's Archives of Surgery. 2009, 393 (2): 141–147. PMC 1356504. PMID 18043937. doi:10.1007/s00423-007-0250-x. ^ Cillo, Umberto; Vitale, Alessandro; Bassanello, Marco; Boccagni, Patrizia; Brolese, Alberto; Zanus, Giacomo; Burra, Patrizia; Fagiuoli, Stefano; Farinati, Fabio. Liver transplantation for the treatment of moderately or well-differentiated hepatocellular carcinoma. Annals of Surgery. February 2004, 239 (2): 150–9. PMC 1356206. PMID 14745321. doi:10.1097/01.sla.0000109146.72827.76. ^ Tanabe, KK; Curley, SA; Dodd, GD; Siperstein, AE; Goldberg, SN. Radiofrequency ablation: the experts weigh in. Cancer. 2004-02-01, 100 (3): 641–50. PMID 14745883. doi:10.1002/cncr.11919. ^ Tateishi, R; Shiina, S; Teratani, T; Obi, S; Sato, S; Koike, Y; Fujishima, T; Yoshida, H; Kawabe, T; Omata, M. Percutaneous radiofrequency ablation for hepatocellular carcinoma. An analysis of 1000 cases. Cancer. 2005-03-15, 103 (6): 1201–9. PMID 15690326. doi:10.1002/cncr.20892. ^ Chen, Min-Shan; Li, Jin-Qing; Zheng, Yun; Guo, Rong-Ping; Liang, Hui-Hong; Zhang, Ya-Qi; Lin, Xiao-Jun; Lau, Wan Y. A Prospective Randomized Trial Comparing Percutaneous Local Ablative Therapy and Partial Hepatectomy for Small Hepatocellular Carcinoma. Annals of Surgery. 2006, 243 (3): 321–8. PMC 1448947. PMID 16495695. doi:10.1097/01.sla.0000201480.65519.b8. ^ Yamamoto, Junji; Okada, Shuichi; Shimada, Kazuaki; Okusaka, Takushi; Yamasaki, Susumu; Ueno, Hideki; Kosuge, Tomoo. Treatment strategy for small hepatocellular carcinoma: Comparison of long-term results after percutaneous ethanol injection therapy and surgical resection. Hepatology. 2001, 34 (4): 707–713. PMID 11584366. doi:10.1053/jhep.2001.27950. ^ Interventional Radiology Treatments for Liver Cancer. Society of Interventional Radiology. [2014-02-04]. （原始内容存档于2014-02-08）. ^ Kooby, DA; Egnatashvili, V; Srinivasan, S; Chamsuddin, A; Delman, KA; Kauh, J; Staley CA, 3rd; Kim, HS. Comparison of yttrium-90 radioembolization and transcatheter arterial chemoembolization for the treatment of unresectable hepatocellular carcinoma. Journal of Vascular and Interventional Radiology. February 2010, 21 (2): 224–30. PMID 20022765. doi:10.1016/j.jvir.2009.10.013. ^ Llovet, Josep M.; Ricci, Sergio; Mazzaferro, Vincenzo; Hilgard, Philip; Gane, Edward; Blanc, Jean-Frédéric; de Oliveira, Andre Cosme; Santoro, Armando; Raoul, Jean-Luc. Sorafenib in Advanced Hepatocellular Carcinoma. New England Journal of Medicine. 2008-07-24, 359 (4): 378–390. ISSN 0028-4793. PMID 18650514. doi:10.1056/nejmoa0708857. ^ Madoff, DC; Hicks, ME; Vauthey, JN; Charnsangavej, C; Morello FA, Jr; Ahrar, K; Wallace, MJ; Gupta, S. Transhepatic portal vein embolization: anatomy, indications, and technical considerations. Radiographics. September–October 2002, 22 (5): 1063–76. PMID 12235336. doi:10.1148/radiographics.22.5.g02se161063. ^ Yttrium-90 microsphere radioembolization for the treatment of liver malignancies: a structured meta-analysis. European Radiology. April 2009, 19 (4): 951–9. PMID 18989675. doi:10.1007/s00330-008-1211-7. ^ Kumar V, Fausto N, Abbas A (editors). Robbins & Cotran Pathologic Basis of Disease 9th. Elsevier/Saunders. 2015: 821–881. ISBN 9780323266161. ^ Cancer. World Health Organization. February 2006 [2007-05-24]. ^ Choo, Su Pin; Tan, Wan Ling; Goh, Brian K. P.; Tai, Wai Meng; Zhu, Andrew X. Comparison of hepatocellular carcinoma in Eastern versus Western populations. Cancer. 2016-11-15, 122 (22): 3430–3446. doi:10.1002/cncr.30237. ^ Goh, George Boon-Bee; Chang, Pik-Eu; Tan, Chee-Kiat. Changing epidemiology of hepatocellular carcinoma in Asia. Best Practice & Research Clinical Gastroenterology. December 2015, 29 (6): 919–928. doi:10.1016/j.bpg.2015.09.007. ^ Rowe, JulieH; Ghouri, YezazAhmed; Mian, Idrees. Review of hepatocellular carcinoma: Epidemiology, etiology, and carcinogenesis. Journal of Carcinogenesis. 2017-01-01, 16 (1). doi:10.4103/jcar.jcar_9_16 （英语）. ^ Yang, Jian-min; Wang, Hui-ju; Du, Ling; Han, Xiao-mei; Ye, Zai-yuan; Fang, Yong; Tao, Hou-quan; Zhao, Zhong-sheng; Zhou, Yong-lie. Screening and identification of novel B cell epitopes in human heparanase and their anti-invasion property for hepatocellular carcinoma. Cancer Immunology, Immunotherapy. 2009-01-25, 58 (9): 1387–1396. doi:10.1007/s00262-008-0651-x. ^ Huntington Medical Research Institute News, May 2005 互联网档案馆的存檔，存档日期2005-12-10. ^ Braconi, C; Valeri, N, Kogure, T, Gasparini, P, Huang, N, Nuovo, GJ, Terracciano, L, Croce, CM, Patel, T. Expression and functional role of a transcribed noncoding RNA with an ultraconserved element in hepatocellular carcinoma. Proceedings of the National Academy of Sciences of the United States of America. 2011-01-11, 108 (2): 786–91. PMC 3021052. PMID 21187392. doi:10.1073/pnas.1011098108. ^ Journal of Clinical Oncology, Special Issue on Molecular Oncology: Receptor-Based Therapy, April 2005 互联网档案馆的存檔，存档日期2005-11-30. ^ Adjuvant intra-arterial iodine-131-labelled lipiodol for resectable hepatocellular carcinoma: a prospective randomised trial. The Lancet. 1999, 353 (9155): 797–801. PMID 10459961. doi:10.1016/S0140-6736(98)06475-7. ^ Hepatocellular carcinoma: the need for progress. Journal of Clinical Oncology. 2005, 23 (13): 2892–9. PMID 15860847. doi:10.1200/JCO.2005.03.196. （原始内容存档于2005年11月5日）. ^ ennerex Granted FDA Orphan Drug Designation for Pexa-Vec in Hepatocellular Carcinoma (HCC) 互联网档案馆的存檔，存档日期2014-03-25. ^ Sanoff, Hanna K.; Kim, Richard; Ivanova, Anastasia; Alistar, Angela; McRee, Autumn J.; O’Neil, Bert H. Everolimus and pasireotide for advanced and metastatic hepatocellular carcinoma. Investigational New Drugs. 2015, 33 (2): 505–509. doi:10.1007/s10637-015-0209-7.